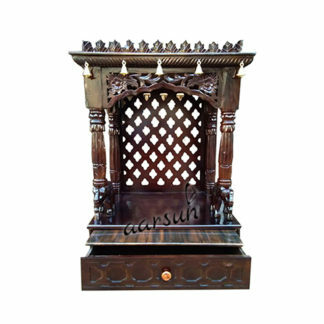 Aarsun woods brings to you the handmade wooden Temple in fine quality wood with fine carving and finishing.There is beautiful mehraab area at the roof top along side carving. Below that there are doors at the front and the doors are beautifully carved by skilled artisans.There are wooden pillars carved at the front of the temple and the side area is covered by wooden jaali. There is ply wood use at the backside, at the base area and at the ceiling of the temple.At the base of the temple there is wooden Drawer placed along with sliding tray. The drawer are beautifully and finely carved by our skilled artisans.The temple stood up at the flat base and best suitable for the home. The temple is made in Sheesham wood along with teak ply. The best place to serve your deity at your home. Rosewood wooden temple has medium texture to coarse with a natural luster. Rosewood wooden temple has a very indistinct color and gives very well finish after hand waxing. Rosewood Home Temple is also used in maritime and aircraft grade plywood. The product is made up of Rosewood temple gives natural look and delicious touch to your home and office. We bought it for our new home. It is beautiful. Looks same as in the picture. Carved beautifully. Do takes 3 weeks of time to deliver. But worth waiting. 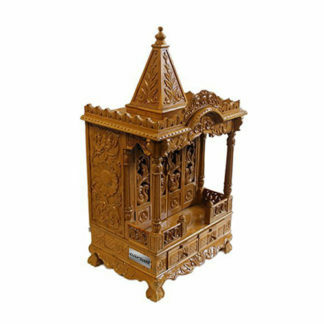 if you are looking for a medium size beautiful mandir. This is for you. Better than the products available in market. Was packaged and delivered safely. Very amazing carving work with nice finishing..
Beautiful piece!! Totally loved it . The support reached from the seller was great and they assisted me at every stage as I wanted to take it to US with us . Very strong communication . Thank you Aarsun woods for you great great support ..